Beware: big, big writeup comin’ at ya! Back at the beginning of the year, FUCheese made some general goals and we all agreed that we really wanted to go to more cheese events and meet more makers of cheese. Since we’d really only scratched the (delicious) surface of the cheese world, we were really wanting to broaden our horizons and get a better understanding of what our region had to offer. Amazingly and luckily, the Pacific Northwest has a lot to offer! 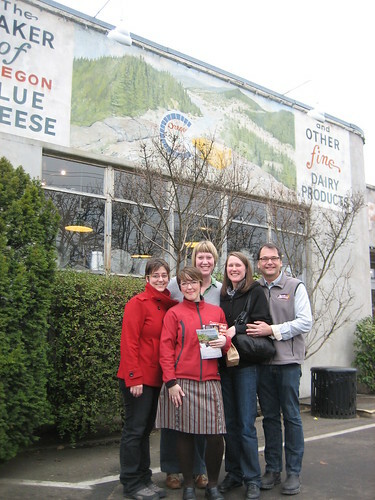 We noted that the Oregon Cheese Guild was putting on a festival in March at the Rogue Creamery. My husband and I had such a good time visiting the Creamery last August that I was eager to go back again. 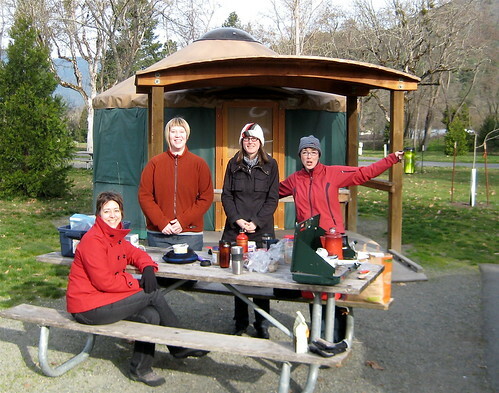 Nicole and I started looking into accommodations since Central Point, Oregon, is a good five-hour drive from Portland, and discovered yurt rentals at Valley of the Rogue State Park. The price was right — $27/night — and we love camping so we made the reservation. Our friends Jen and Linnea decided to join us and we headed down Friday afternoon with a car loaded with camp gear and sleeping bags. On Sunday morning, it rained and poured and rained some more so we huddled under that little porch and did breakfast and coffee. It was quite cozy! The campground also had showers and bathrooms that were very clean. A few steps away and you can get down to the Rogue River and sip your coffee there. After breakfast, we headed out to the festival…. I’m going to spoil the ending here and say that the festival was a blast. There were over a dozen cheese vendors and half-dozen or so wine vendors plus breads, seafood and jerky! 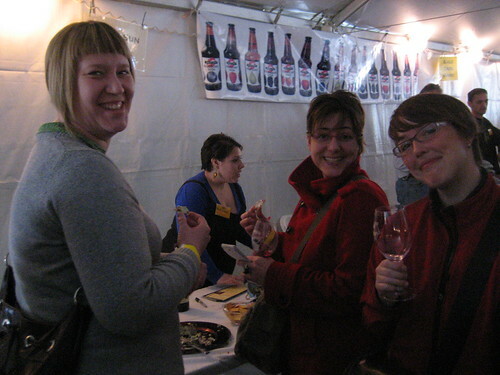 We got a wine tasting glass with the Oregon Cheese Guild logo on it and were set loose on the event. It was set up so that generally there was a cheese booth and next to that a wine booth or a food booth so you could go back and forth. The cheese samples were moving fast and furious but all the vendors seemed in very good spirits and were great at answering the same questions over and over and over again. 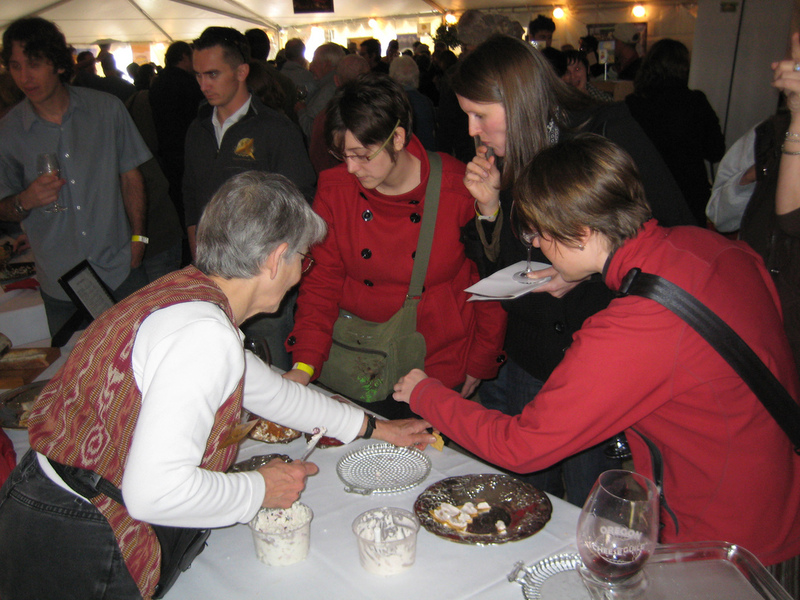 We sampled some extraordinary cheeses, Sublimity from Oregon Gourmet Cheeses and the chanterelle-coated chevre from Fern’s Edge Goat Dairy (photo above) stand out from the first go-round of tastings. We got there around 11:30 and the crowd was already pretty healthy. By the time we got out of the creamery tour at around 2:30, the crowd was roaring. I don’t know if that was an issue for anyone and I’m not sure what they could have done about it — apparently, the appetite for exceptional artisinal cheeses and wine is very strong! We scooted right through the crowd and got into the Master Cheese Tasting class (more on that below under “tasting notes”) where we were treated to a sit-down cheese tasting of six world-class cheeses and learned about how to taste and smell and evaluate cheeses. After the class, it was almost closing time so it was a mad-dash to go buy some of our favorite products! Sadly, some things had sold out and there was a second mad-dash for alternates. I zoomed right over to Willamette Valley and grabbed a wedge of their Borenkaas aged gouda which I’ve had my eye out for months after tasting it at a House Spirits event. Then I swooped in on Oregon Gourmet Cheeses for a wedge of the wine washed rind goat cheese, the other girls grabbed wedges of Sublimity. I then got a bag of mix for beer batter bread from co-owner Bob Russell of Butte Creek Mill — great salesman! And then picked up some yummy elk jerky from Gary West Smoked Meats. Lastly, we stopped at the little wine tasting room which the creamery has built next door and grabbed a few bottles — their Daisy Creek Voignier was superb and I took a bottle of that home. After that mad dash of gabbing, grabbing, sipping and sampling, the FUCheese crew was plum exhausted. We got a recommendation from David of Zen Zen for dinner, a sushi place on Central Point’s main drag. We all agreed that for off-the-beaten-path sushi, this place did a great job. Seriously. I would look forward to eating there again. 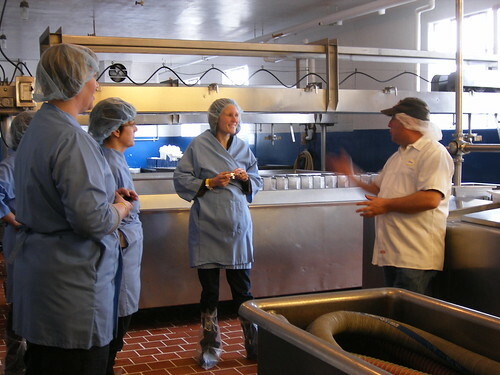 Now, I’m going to back up a little bit and talk about the creamery tour we went on and also give some tasting notes from the cheese tasting workshop we went to. If you’ve already had too much cheese talk then go check out Nicole’s photos or my photos. You’ll note that there’s some cute baby goats in those photos — that’s from our Sunday adventure and Nicole is going to do that writeup shortly. Okay, on to the tour…. Our friend, Linnea, who came down to the festival with us knows the current owner of the creamery from a past life as a cheese buyer for Whole Foods London. She contacted him ahead of time to let him know that we’d be coming down and he said we had to take a tour so we did! It was such a treat. Plant manager and Rogue Creamery cheesemaker, Craig Nelson, and Anna Campbell who does sales, showed us around the creamery, answered our endless questions and were a lot of fun to chat with. Here’s Nicole, Jen and Linnea in the cheddar room (in awesome sanitary apparel kindly loaned from the creamery) listening as Craig explains how the milk comes from a farm that the creamery works with exclusively, is pasteurized and then cheddared right here. 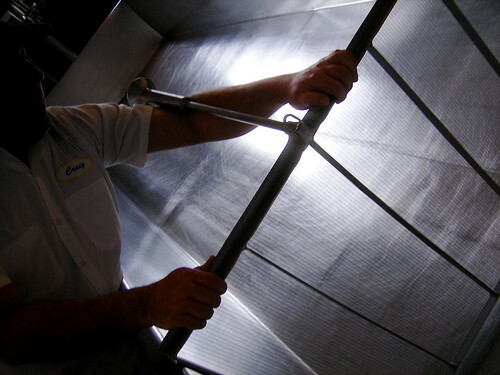 Craig is Army retired and we could tell that he runs a tight ship there at the plant. We had a great time and really enjoyed talking with Craig and Anna. As I said before, it made a great trip truly memorable! Thanks to you both and David for arranging it. First up, at the top of the plate is the creamy River’s Edge Chevre. Kate and Janet instructed us to first take a good sniff of the cheese and really take in the aroma — just like with wine! This had a fairly light scent, very milky and fresh, slightly grassy. The texture was fluffy and delicate, Janet described it as almost mousse-like which it was. It had the flavor of creme with a slight lemony tang. I’m probably not alone in associating chevre with a dry, sometimes chalky log. 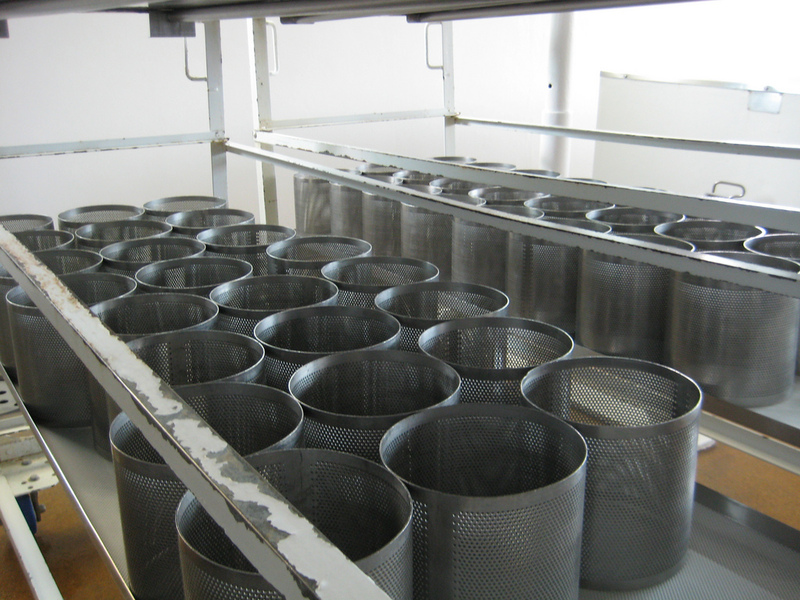 Apparently, this has to do with the rate of draining of the cheese — the quicker you drain it (press the cheese?) the more dense and sticky the texture. This was really anything but. If you’ve had any of River’s Edge cheeses, you know they are wonderful and this is one of my go-to favorites. Continuing clockwise, a raw milk cow cheese called Brindisi from Willamette Valley Cheese Co. It’s an “Italian style fontina.” This firm cheese had a very light aroma and was quite salty and tongue-coating. It had an explosive flavor with a mellow and slightly tangy aftertaste. I have to say, I am in love with Willamette Valley’s cheeses so it’s a good thing that I’m seeing their cheese everywhere. Yum! Janet recommended pairing a bold wine like a Pinot Noir with this. The third cheese is another one of my favorites, Pondhopper from Tumalo Farms, a goat. It has a lovely nutty, buttery aroma and a meaty, full flavor. The cheese is washed in a local beer, rumored to be Deschutes Brewing Mirror Pond Pale Ale, and does have a hint of hops. Janet recommends sherry or madeira to pair with a cheese like this that has a certain sweetness to it. Bottom, left, is Sublimity from Oregon Gourmet Cheese this is another raw milk cow’s cheese and was a favorite from our group as we made our way around the tasting tent. It has a nice, tangy aroma and the flavor had a slight bitterness hinting at a blue note, a little mushroom compost in there maybe! It was quite salty and maybe too much so? It was definitely a standout cheese among all the others. 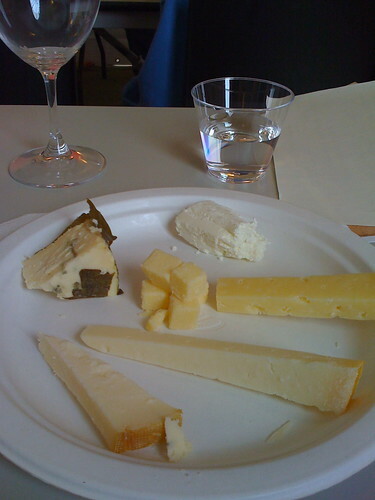 The middle of the plate, the little cubes, is a cheddar from Tillamook Creamery. This is their 100th anniversary, 3-year cheddar. It was sharp, gritty and coating. Also subtly tangy and slightly oily. Kate or Janet offered that it was probably made as a large, 40lb block, aged anerobically and sealed in a bag — otherwise it would be hard as a rock! It was a great tasting cheddar. Last but not least, that formidable looking hunk of blue cheese at the top left. It was a real treat, a bit of the new mini wheel of Rogue River Blue from the Rogue Creamery. Cary Bryant, the head cheesemaker and co-owner of the creamery got up and let us know that as they were working on this cheese, they thought it was absolutely delicious but looked really ugly. Thus, through some trial and error and experimentation came up with wrapping the wheel in grape leaves soaked in pear brandy. It gives off a slight pear scent at the rind and eating a bit of the leaves with the cheese imparts a unique vegetal flavor to what is already a very earthy, figgy cheese. It is slightly sour but with an underlying sweetness. If you are a fan of blue, this cheese is pretty wild with lots of flavors. I’m not a huge blue fan but I really did appreciate how much was going on with this cheese. And that’s the writeup for the festival. We had an unbelievable time. I went into this not really knowing what to expect but it was really great fun and I came away just in awe of all the amazing food that is being produced in Oregon. I love this state! Stay tuned for Nicole’s writeup on our great time playing with the goats at Pholia Farms the next day. Pics and more pics.